I picked up on a comment left on a previous CANSLIM article in March 2011. CANSLIM/William O'Neil does not use any YTD to Last YTD comparisions. I suspect, you used these as the site lacks a Q to last Yr Q for the last 3 qtrs. In addition, it is acceptable to have prior qtrs be less than 25%, as long as you have accelerating EPS gains and the last Qtr is above 25%. You should add sales growth (Q to last yr Q) above 25%. As for annual earnings gain, the last year should be 15%, with 3 yrs of growing EPS - a 5 yr growth rate of 25% is ridiculus - as it would exclude many growth stocks that have started their move in the past year. You should also add in profit margins of at least 18%. Just to ensure institutional quality stocks, screen for stocks >$12, 250K in avg daily volume and within 20% of it's 52-wk high. In response, I have tweaked our original scan to take on board some of R. Paluszak's concerns. Some of the issues raised can be addressed in a later version of Stock Screener, but based on existing Screener criteria the CANSLIM screen will adopt the following parameters. Topping the scan is still Apple (AAPL). The stock will get plenty attention today following Steve Jobs announcement. Premarket prices show it trading around $366 which is above a thick band of support running between $355 and $362. The 200-day MA has risen to $342 which will offer another tier of support. Will investors buy the news? Second spot is held by Vale S.A. (VALE). But this is a stock which is struggling to recover from a 24% trim in price at the start of April. It's doing what it can to hold $24 support but it's hard to see it getting past its 200-day MA or 50-day MA anytime soon. The new search criteria has brought Oracle (ORCL) onto the list in third spot. However, having lost its 200-day MA in July it has experienced a steady march towards lower prices. Primary support exists in a thick band between $21-$23, but given it was quick to cut through July breakout gap support at $26 buyers may be less willing to step in. One to avoid. Fourth spot goes to CNOOC (CEO). Stock price action is also sickly, falling hardest once its 200-day MA was breached. It's attempting to find support around $180, but even if the stock does bounce it will quickly run into resistance marked by prior swing highs. Look for narrowing price action in the months ahead. Fifth on the list is Barrick Gold (ABX). Unchanged from before is all one can say here. Stuck in the middle of its trading range. Sixth was Baidu (BIDU). The recent decline held converged 200-day MA and channel support. As long as the sequence of higher lows and higher highs is retained the trend is bullish and buys are favoured. 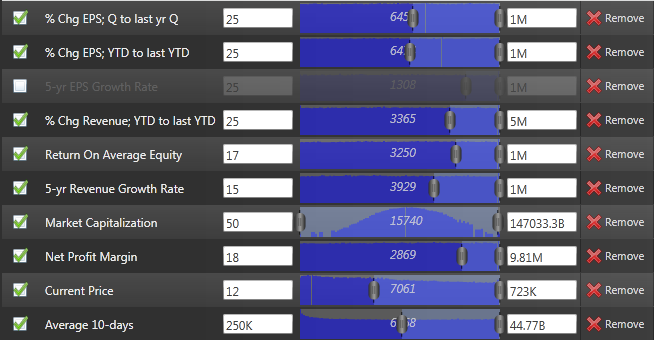 The one negative has been the tepid buying volume on up days compared to selling volume on down days. Next up is Free McMoran (FCX). The stock has gone from breakout, to breakdown, to failed rally. It held $42 support which offers an opportunity for buyers to launch a second attack on $47 resistance. A failure to do so would bring into play next support at $32. The final stock on the list is Priceline (PCLN). In the last update it was trading at support, but has since lost trend support on a gap down. It's in the process of confirming the break with a mini-rally. 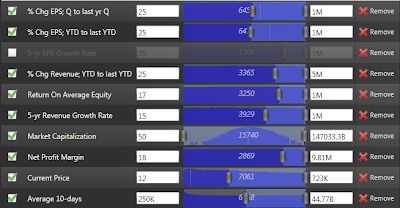 Shorts are likely to be active at current prices with the breakdown gap all but closed. A move above $500 would likely send them scrambling, but until then it may be one to sit out and see how it plays out. Take this a step further and build an Alert on to your Active Screen list. Why not start your Zignals Trading Strategy Business with us today? 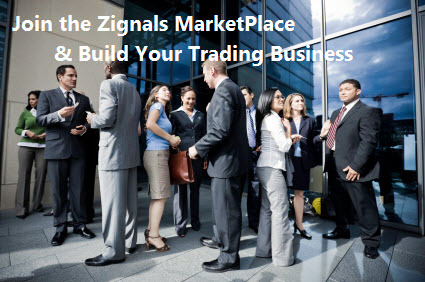 Learn How to promote your Zignals Trading Business with Twitter.